It's almost Thanksgiving, my second of the year, actually. Some of my family live in Canada, so we already gathered there and ate turkey on October 12th, while we made our Christmas plans. We're hoping this year that Grandma Leighton can make it to Queensville before Christmas to see the house (in which she was a young bride and mother for so long) and maybe even visit with old friends. And me? Since I've already done the family Thanksgiving thing, American Thanksgiving this week will be spent with friends, all us 'singletons' (as Bridget Jones calls it) and a few couples. Wine, good food, treats, some bad karaoke... wild turkeys couldn't tear me away from the fun! As long as murder doesn't get in the way... you know, it has a nasty habit of doing that to me. So, what will you be doing for Thanksgiving? Celebrating with family? Friends? 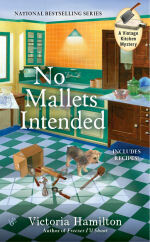 Giveaway open to Canadian AND US addresses... comment here before Midnight, November 21st to enter to win a copy of No Mallets Intended (which has the approach to Thanksgiving!) 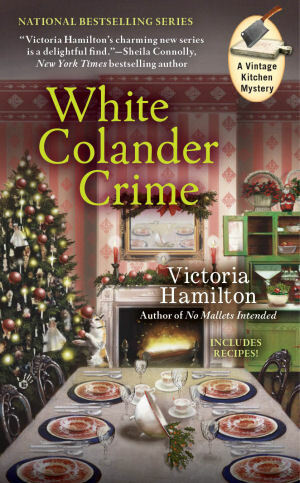 and White Colander Crime, which takes place between Thanksgiving and Christmas. Both of these books sounds awesome! Thank you for a chance to win. We're just staying home and having a quiet Thanksgiving. I can't wait to read these! Thanks for the chance! I love all of Victoria's series and eagerly await each new one. I love the vintage stuff. Going to the sister in laws for Thanksgiving this year. We all contribute with my sister doing the most. I make the pies each year. Phone calls to family members across the country. Love this series! I love Jaymie and her vintage kitchen...but she always makes me want to hit the antique flea markets :) Happy Thanksgiving to all! Going to my aunt's house with my parents and daughter. Love this series!!!!!!!!! I'm making the full dinner for my hubby and I---we'll have leftovers galore. The leftovers are the best part of Thanksgiving. I will be celebrating with friends this year. I am bringing the stuffing! Happy Thanksgiving! I will be celebrating with family and fixing Thanksgiving dinner and chilling afterwards. This is a terrific series, and I love holiday reads. Thanks for the giveaway. It'll be a quiet Thanksgiving at our house this year. Just hubby, me, our three kiddos, and my brother. My folks and older sis and brother-in-law are going to Hawaii and other sis in Colorado won't be making it home this year. Thank you for the chance to win! A very happy Thanksgiving to you! I'm celebrating with family and friends this year. Not at my house, for a change. LOL Thanks for the giveaway. 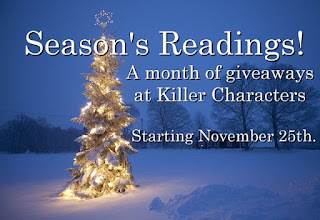 Great giveaway and a great way to celebrate Thanksgiving! Thanks! We're celebrating with family. They come for deer and pheasant hunting but we are happy to have them here for Thanksgiving also. I love VictorIa' s books so this is very exciting. It will be a quiet Thanksgiving with just my husband James and our cockatiel, Speckles. He loves to taste a bit of our food and I think he will really love the sweet potatoes; It is a big change from when I just to get up at 5 in the morning to put the turkey in the oven and prepare the dressing and pies! What a stupendous Holiday giveaway! Thanks. Small family group for Thanksgiving. There is still some to and froing going on to decide where. Sigh. Both of these books sound wonderful. Thank you for a chance to win. I will be celebrating with family and helping cook our Thanksgiving dinner..
What a stupendous giveaway! Thanks. Small family group for Thanksgiving. These two books sound wonderful. I would love to be the one to receive them. Just immediate family for our Thanksgiving. 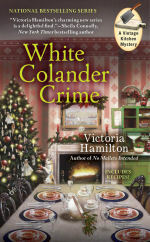 Looks like great cozy mystery.Both books look like a great read. Both of these look great! I love that they are part of the vintage kitchen mystery series. celebrating with family at my sister's house. we all contribute to the meal. We're having Thanksgiving twice this year! A simple meal on Thanksgiving Day for my husband, my 91 year old father and me, and a huge turkey dinner with all the trimmings the Sunday after, when both my daughters and spouses will be in attendance. Twice the blessings! I hope you have blessed Thanksgiving! Thank you for the giveaway! Happy second Thanksgiving to you! Would love to read your books. I love finding new authors I have missed. Happy 2nd Thanksgiving. 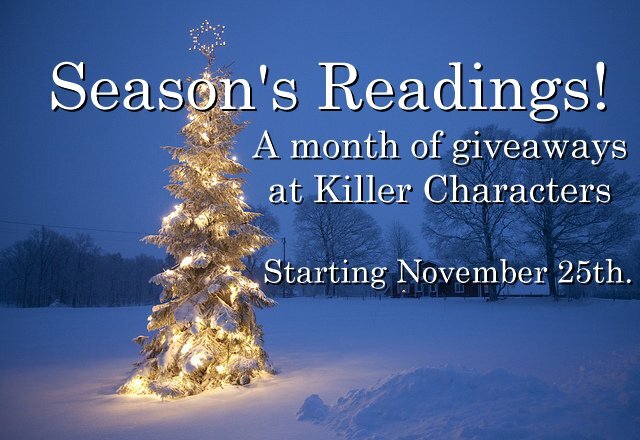 Would love to read your books..Discovering a new author is awesome.